My first time using Rukka and they are top quality. 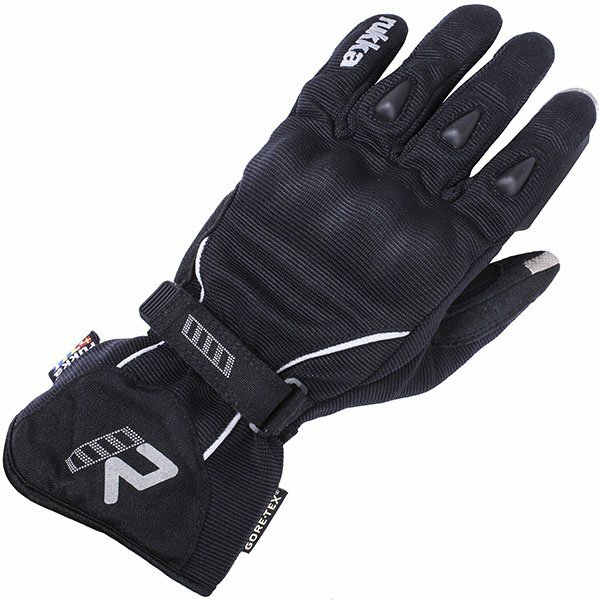 The fit is perfect and they are the perfect gloves for Spring and Autumn. I haven't used them in extreme cold or rain yet but they seem a little on the thin side to be a Winter glove. I would definitely recommend these gloves. I'm new to the Rukka brand, having bought a jacket of the same brand at the NEC in 2018. I bought these gloves for three of the advertised features: waterproofness, armour and being able to use a touchscreen. I've not used these in wet weather yet (though expect to in the days to come!) and have been VERY impressed with the quality. The fit is a little on the tight side, but I'm expecting them to give a little to my hands over time. Touch controls work superbly. The armour is in all the places I would like and feels snug and shouldn't move when (if) ever needed. They're thin, so don't expect to use these on cold days unless you have heated grips. They'll either be on my hands or in my bag as my backups in adverse weather. Received these to use as my Autumn gloves. They are really comfortable and I'm using them even in the winter for short (30min) rides. They are comfortable and have rukka quality as expected. Highly recommended. for sizing I'm normally a rukka size 11, which on sportsbike is the XL. Since receiving the gloves (quickly and efficiently as always, thank you Sportsbikeshop) it has rained every day on my daily 48mile commute, not once have I felt a slight bit of dampness come through. Not the thickest or warmest glove, However they have been good enough for a 3oC ride and you can still feel the heated grips through them. Recommend. Lovely cloves! very comfortable! The important thing they are 100% water proved!!!! My second pair, really good spring/autumn / wet summer glove. Visor wipe is excellent as well, really large. If you have cold hands like me you will need something warmer for proper winter though. High quality, windproof and waterproof. Good tactile control feel. Highly recommend. Really nice gloves, good feel on the controls and waterproof as expected. Not overly warm or windproof but work well with heated grips. Really good fit, comfortable and they look great. Not tested for waterproofing yet because of this great weather! I have been looking for a nice "pair" for ages. So comfortable, excellent material. well worth the money. What wouldn't you do for a nice "pair"
Great material, very comfortable and excellent looking glove. These are my second pair and come with the usual Rukka quality you would expect. Only fault is that Rukka paint a bunch of nice little dots on the fingers as part of the design, and these fall off after a few rides. But these are on the inside and don't effect the look of the glove. Bought these to replace some very old and faithful Hein Gericke gloves. The fit is great. They're totally waterproof. They worked great in 25C so imagine they'll be fine all through summer. The protection is well placed and the visor wipe is soft enough that it forms to my visor and clears water effectively. All around an excellent piece of 3 season kit. Very happy with these gloves and the staff were very helpful when it came to selecting what size I needed. Delivery was prompt. I did a lot of research into what I wanted from a winter glove. It needs to be comfortable and easy to put on, it needs to be weather proof and it needs to still allow me to ride safely. In a few weeks I've ridden in conditions from sub-zero to torrential rain, so have had a real opportunity to test them. They are really comfortable. They fit well and i am able to brake and use switches and buttons without any problems. They are understandably bulkier than my current gloves, but they are neither waterproof or insulated. In sub-zero i could feel a little of the cold, but only a little. There is plenty of room in them for a thin base layer style glove if I need it. The visor wipe works well and is a useful addition. The cuff is flexible enough to easily stretch over my jacket cuff, and doesn't let in any draught. The protection is substantial on the knuckles and heal of the hand and thankfully I have had no need to test it properly, but it feels like it would do it's job. I was so pleased i bought these as i struggled to find a glove I'd be happy with. These gloves are quality and worth every penny of the £150 price tag. Great gloves, really light and flexible. Great quality and so comfortable. So far I'm very pleased with these gloves. They look good, feel very well made and fit perfectly and so are comfortable. Not cheap but you get what you pay for. Not ridden in any downpours yet but I'm confident they'll keep my hands dry.